An online pharmacy you can trust; products will conveniently ship from our trusted distributor directly to your door! Our online pharmacy allows our team to offer an increased variety of trusted, veterinarian recommended, Heartworm, Flea, and Tick products along with other pet supplies including non-prescription and prescription pet foods, pet toys, collars & leashes, grooming supplies and much more! Our Online Pharmacy is a secure site, meaning that once you are registered, your information stays safe! 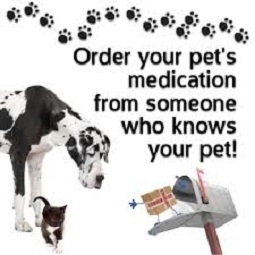 Whether at home, traveling, or on vacation, you can order medication 24/7 from us, which makes taking care of your four-legged-friend convenient for you! Our Pharmacy will ship your order directly from our trusted supplier to your door, anywhere in the continental United States! ONE: Simply provide us with your daytime telephone number and email address! We will email you a confidential password to login to our secure Online Pharmacy! TWO: Log on to our store through our website! Simply visit our website and click on the Fayette Veterinary Pharmacy link (green paw print). At the store login site, simply click on "New Customer" and fill out your information. We will email you a confidential password to login to our secure online Pharmacy. Many orders qualify for free shipping! Shipping charges can vary depending upon the items purchased (prescriptions, food, collars, etc.). Please refer to the Shipping Policies page when visiting our Online Store.